Fits your budget. Environmentally friendly. Community-oriented. Serving hotels, gyms, fitness studios, salons, spas, short term rental managers, janitorial companies -- and your business -- in Philadelphia, Boston, Worcester, and Washington, DC. Commercial Laundry and Linen Rental Services that make a difference. 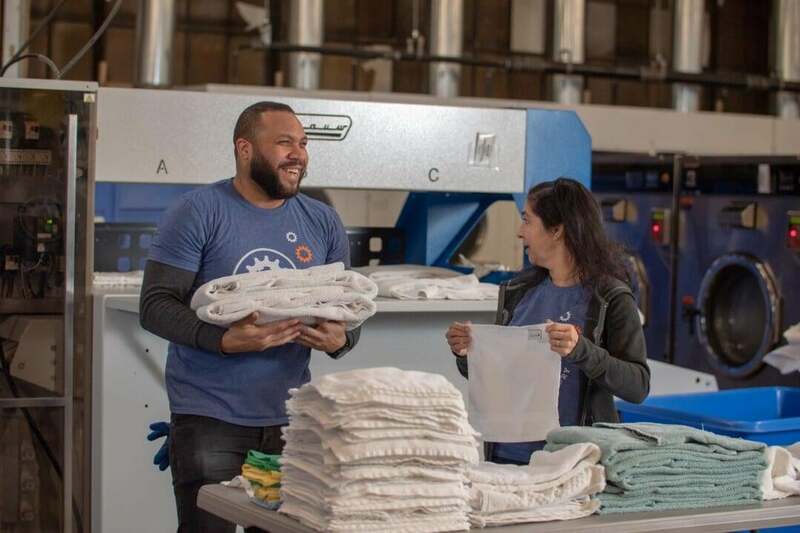 We were founded in 2010 as a laundry and linen rental service and a social enterprise to create jobs and second chances for people overcoming histories of homelessness, incarceration, and more. Today, we provide commercial and hotel laundry services to everybody from owner-operated hair salons to global hotel brands. If laundry is a basic part of how you get your job done, we can help. We serve amazing businesses in Philadelphia, Boston, Worcester, and Washington, DC. We wash guestroom linen for big brands and boutique/independent hotels. We offer a process that meets your budget and safeguards your linen inventory from loss, stains, and damage. We rent towels and wash customer-owned laundry for all types of gyms and fitness facilities, including big gyms, private fitness centers, and group fitness studios of all types. We work with corporate spa chains/franchises, boutique operators, and solo bodywork practitioners. We rent linens and wash customer-owned sheets and towels for managers of hundreds of short-term rentals. We can even store your linen on our premises, subject to availability. "If I can treat just one more patient per month, that pays for the laundry." "Your people are well-trained, they know what to do and where to go. Businesses like mine should use Wash Cycle Laundry because it's easy and reliable"
"Wash Cycle Laundry is efficient, convenient, and they care about the environment"
We're proving bikes are a viable alternative to trucks for delivery in urban areas and building a launching pad into upwardly mobile careers for our cities' most vulnerable adults. Learn more about our Social and Environmental Impact.